I have used many different marine services over the years, some are very good. I would say though, that there are many shonky operators around, and wallet-surgery is ramoant and damaging. Many incompetent operators leave a trail of damages behind, overcharging and bungling in equal proportion. Consumer Guarantees, for Acceptable Quality, Fitness for Purpose, Repair, Replace, Refund - all compromised because, under the Admiralty Act "repairs or alterations to a ship", which floats on the tides, must be heard in a court. That means delay, coverups, misrepresentation. I was poisoned twice, by "Sydney's Premier" diesel mechanic, with carbon monoxide. The mechanic, Philip Lulich, has no license, and very poor engineering and managing skills. He claims to have been in the marine industry for ten years, and boasts that he works on the maxi Wild Oats. I have had an electrician leave behind a battery which was cooking and emitting acid for hours, and lucky i was around to stop it. Some small marinas are very good, some very bad. Standards across marine services is very varied. Choosing an operator is risky and potentially life-threatening. Plumbers and electricians on land are much better trained overall, the industry is well regulated because it relates to houses. Why are shonky mechanics like Phillip Lulich continuing to thrive, working with poisonous gases not a care in the world? Getting CO2 poisoning on land is unusual. Except with caravans and gas heating disasters.. The Coroner has recommended CO2 alarms as mandatory in small sealable spaces, like in caravans and boats. 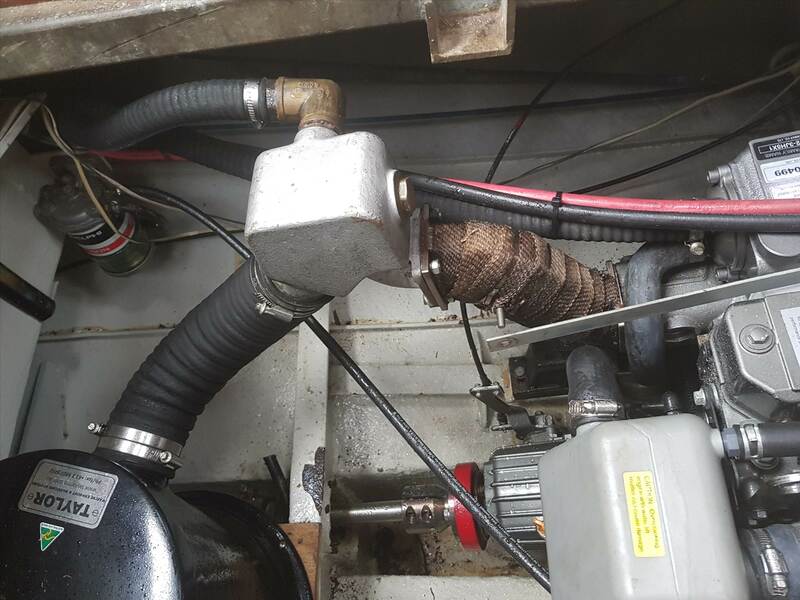 Better licensing and regulation means bureacracy sure, but along with that comes definite ways to complain, to ensure there is no compromise any longer, of boat owners' Consumer Guarantees, which are supposedly, after all, non-negotiable. bad exhaust construction. structurally unstable, on a vibrating engine badly aligned is a deathtrap. Why no licenses even when working with poisonous gases? That looks like an oem manifold so is the problem with the lack of support or structure or the componentry used. i don't know the guy your bad mouthing (on a public forum rightly or wrongly) but............man you want to have all your facts and present your story way more transparently than the way you have, as an example the reader wants more detail to enable a subjective and balanced opinion to be formed, please retell your story and fill in the blanks, I have given you a brief example below. perhaps follow that format and see how we go. My name is ........................ I have had the boat for ......................years. The exhaust was always/not always assembled like this. I first noticed a sound/smell/ ......so on and so forth,,,,,,,,,,,than and for the readers at home perhaps a summary,,,, and that's when I realised I had carbon monoxide poisoning. Then and only at that point can you say I believe blah blah blah because the bracket wasn't tight or the gasket didn't seal or I didn't even know there was extraction fans in the engine room which were supposed to be on????????? I recommend you take on more responsibility for your situation and stop laying blame on others. You name him, how about you have the guts to name yourself Mr Psuedonym. No, i don't make mistakes, I'm trained in Motor mechanical (principally standard road vehicles including light diesel trucks), worked as an Auto accessory fitter, trained in Oxy, Arc and MIG welding metal fitting with how to use steel types and medium joining materials. Carpentry and farm fence building i had done some by the age of 5 (i put up a farm fence alone when i was five - around 50 meters). I don't do a **** job like that! SIUYAYF ! Only light aircraft engines don't tend to have any vibration damper, damping is done by the mounting frame spar lengths torsioning / wobbling (as vibration) to dissipate vibration they are clamped on solid to keep the critical output drive shaft perfectly direct and not encourage subtle misalignment or excessive vibration from rubber failures . A hypothetical question for anyone - "if you knew that a mechanic was unlicensed and had poor mechanical and management skills ....... would you engage them to do your work on something as important as your marine engine?" A statement based only on the facts at hand - "if you knew this and still engaged the services of the person then more fool to you because you only did it for one reason and that was he was cheap"
Your comments regarding regulation for the industry are valid, but for you to make your very first post on these forums a quite public slander of the mechanic you have named seems a little foolish.